On Sunday we were across the river in Vancouver for a concert my daughter was in, so I got to make my first visit to By the Bottle. If you haven't been there, it's a fabulous beer store right in downtown Vancouver. 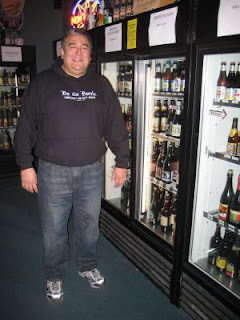 That's a picture of Dave, the owner, standing next to some of his bottled treasures. Oops, Ezra just tweeted that Belmont Station now carries Laughing Buddha, but I didn't know that on Sunday when I picked up a bottle of their Purple Yam Porter. I haven't tried it yet, but I did enjoy my Southern Tier Tripel, ridiculously hoppy though it was. There was also a great selection of Port's top-shelf Lost Abbey beers. Set yourself a budget before you go in. Does anyone know why Shiner isn't distributed in Oregon anymore? Two or three years ago it briefly appeared in Portland. Anyway, I couldn't resist picking up a bottle of Shiner Bock at By the Bottle. I was really hoping to find the Shiner Holiday Cheer that came out this winter, or the 100th Anniversary doppelbock they just released. I'm not sure if those specialty brews make it to Washington, but Dave said he hadn't been offered any by the distributor in Seattle. Dave described his shop to me as a labor of love, and it shows. He actively seeks out smaller Washington breweries, and considers it a part of his mission to give them a toehold in the Portland market. Be sure and stop in to By the Bottle if you're up in the 'Couve -- it's even open on Sunday, when the whole town shuts down. Click here for the Beer Mapping Project's page on By The Bottle. Labels: retail, visitors' guide, washington, where do I find...? I picked up some Southern Tier while in Seattle a couple months back. The IPA, Red and Oatmeal Stout. All were great (the Stout was the best) and it's great to know it's only a quick trip over the river. By The Bottle is definitely a great place to find hidden treasures and stuff not available here. As you said Port Brewing, Lost Abbey and Southern Tier are reason enough to make the trip to BTB often. I was going to hold off drinking beer until this weekend, but now you've made me thirsty. To the 'fridge!